In early 2014 the University Archives was contacted by William Simpsons, a care home in Plean which provides residential care along with respite and day care facilities. William Simpsons has been providing care at this site for almost two hundred years, originally opening in 1832 as the William Simpson’s Asylum, an institution which provided care and support for former soldiers and sailors. Building work had unearthed a collection of historical material consisting of four large metal trunks of documents and 38 volumes and ledgers. Upon inspection the material revealed itself as a comprehensive collection of nineteenth century records which provide a detailed account of the management and administration of both the William Simpson’s Asylum and the surrounding Plean Estate. The material complimented the historical records of NHS Forth Valley, held in the University Archives and it was transferred to the University Of Stirling. Today we are engaged in an exciting project which is opening up the collection for the first time. This work follows an initial survey of the material carried out with the support of the Wellcome Trust in 2016 which highlighted the value of the collection for the study of both medical and local history. The survey also revealed links between the William Simpson’s Asylum and Stirling District Asylum, with evidence being discovered of regular contact between the two institutions. With the assistance of a team of student volunteers we are cleaning, flattening and repacking the thousands of nineteenth century documents which are crammed, in tightly packed bundles, into the four metal trunks. The contents of these trunks were examined as part of the Wellcome Trust survey which has provided us with a useful overview of the range of material present. Our current project will enable these documents to be used by researchers in our archives reading room, while the unpacking of the bundles will allow more detailed cataloguing of their contents which will provide further information on the collection. 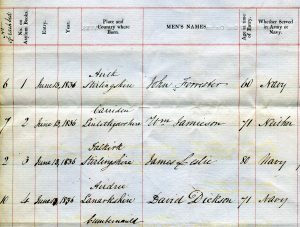 This list provides a detailed account of the first ‘inmates’ of the asylum, recording their names, ages, place of birth, army service and trade. Additional remarks on their character and behaviour are also recorded as are details of burials for patients who died in the asylum. 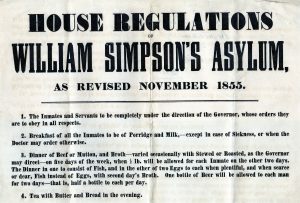 House Regulations of William Simpson’s Asylum, as revised November 1855. For further information and updates on this project please contact the University Archives.